“We are working hard every day to keep America great,” FLOTUS explained after being asked about her and Karens duties in the White House. 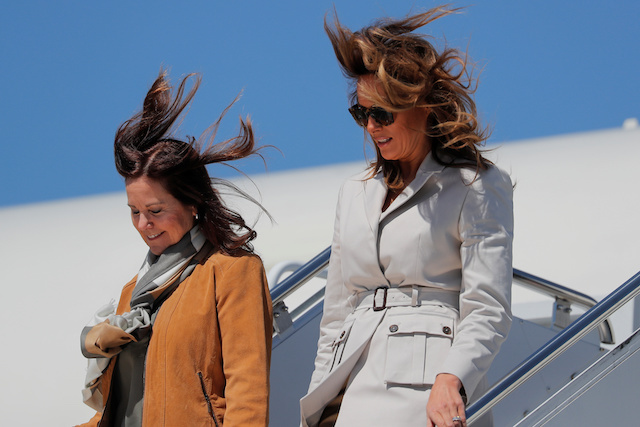 “I think our husbands [President Donald Trump and Vice President Mike Pence] are doing a fantastic job and I would support my husband if he would run again and yes, its a privilege, a great honor to serve,” the first lady explained to the kids. Would love to hear Eltons thoughts (Picture: Rex/Getty) Its no secret that the Spice Girls were wild..
A woman who opened fire near the finish line of a busy marathon in San Diego has been arrested, poli..